LG is refreshing its Android family with brand new member in the F series at MWC 2013, and the LG Optimus F7 is the larger of the two new arrivals. 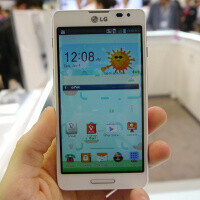 The handset features a 4.7-inch 720 x 1,280-pixel screen and runs on a 1.5GHz dual-core processor. The LG Optimus F7 is clearly a mid-ranger despite the fact that it looks somewhat similar to LG’s last year flagship, the Optimus 4X HD. In the hand, you can definitely feel that the device does not have high aspirations. It is built out of plastic and you can definitely notice that fact. Still it is well-equipped in terms of connectivity with 4G LTE support. The device features an 8-megapixel rear camera with auto-focus. We are yet to hear about the exact price and availability details for the LG Optimus F7 but what we know for sure it’d be arriving to a variety of markets. Why is there a black "inner" bezel??? The screen might be smaller than official specs! Idk but I kinda like it.